It’s time to celebrate the first birthday of the Colourworks collection – a comprehensive range of cookware that combines functional materials with stylish design and bright colours perfect for this time of year. Designed by the award-winning kitchenware company – Kitchen Craft – and launched at the beginning of 2010, the collection is a versatile and cost-effective way of adding funky colourful style to any kitchen. Versatility comes from the option to mix, match and co-ordinate items from the Colourworks collection which are available in a selection of fun colours including this season’s on-trend colour – orange. Prices start from £6 making the range very cost-effective. Different high quality materials such as silicone, nylon, stainless steel and melamine are used throughout the collection, giving choice and adding their own benefits to suit different cooking scenarios. Hygiene and flexibility come from the use of silicone which is totally safe to use on non-stick surfaces. Colourworks utensils are also stain resistant and heat resistant up to 260°C which makes them perfect for all cooking applications. The majority of utensils are dishwasher safe. What’s more, every item in the collection comes with a 5 year guarantee which demonstrates their durability and longevity. Kitchen Craft is one of the UK’s largest kitchenware companies and has won numerous industry awards year on year. The company was first established in 1850 by Thomas Plant and is still a family-run business to this day, being owned and managed by members of the Plant family who are direct descendants of the founder. Kitchen Craft is an international business and their products can be found in leading department stores, cookshops and mail order companies in the UK and around the world. Selected items from the Colourworks collection can be found in all good cookshops and department stores nationwide, including the BHS and Debenhams stores in Cambridge’s Grafton Centre. Below are some of my favourite items from the collection available at BHS. This chopping board is made from polyethylene which is non-toxic, non-stick and stain resistant. Because it is reversible, you can safely cut raw meat on one side and vegetables on the other thus avoiding cross contamination of food. The polyethylene is also gentle on knives which means that you can chop away with the confidence that your blades will stay sharper for longer. This five piece measuring spoon set includes measurements of 1/4tsp, 1/2tsp, 1tsp, 1/2tbs and 1tbs so they are ideal for use when following recipes that require exact measurements for perfect results every time. 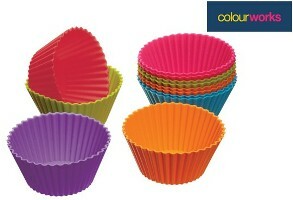 These silicone 7cm (3”) cupcake cases are sure to brighten any day of baking. Being silicone these cases are re-usable as well as being heat and stain resistant. They are available in a pack of twelve containing cases in each of the Colourworks colours to enable you to co-ordinate with other items in the range. This colander is made from virtually unbreakable melamine and is perfect for draining pasta or vegetables. It features a stylish two tone design – white on the inside and coloured on the outside – and has a capacity of 2.5 Litres. This ice cream scoop has a wide angled ergonomically designed handle with soft touch panel which makes serving ice cream easy and comfortable every time. 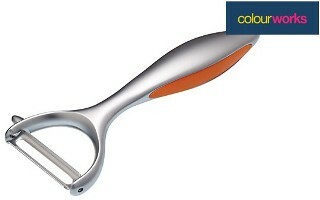 This swivel peeler has a fully rotating stainless steel blade on its ‘Y’ shaped head which is specially designed for fast and efficient peeling. This can opener with wide angled, soft touch ergonomic handle which is comfortable to use and makes opening cans a quick and easy task. 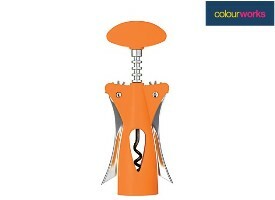 This wing corkscrew with double soft touch handles and body is sure to brighten any kitchen or dining table. The double handles are comfortable to use and will make opening wine bottles quick and easy. These silicone tongs have stainless steel arms and are 30cm long. 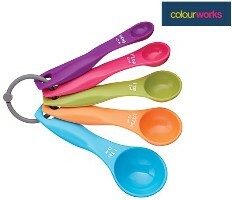 Available in a range of colours, they are guaranteed to brighten up any kitchen or barbeque. They can be used safely on non-stick surfaces and are heat resistant to 260°C as well as being stain resistant. This long handled silicone splatter guard is heat resistant to 260°C and will protect you and your surfaces from spitting fat when frying. It is a really useful addition to the kitchen battery of tools and utensils. Tagged bhs, colour, debenhams, home, kitchenware. Bookmark the permalink.